Today at TIFF I checked out the new Japanese anime film, From up on Poppy Hill. This film is part of the TIFF kids program, so I was very worried about a few things. Would the movie be dubbed? Gross. Would there be kids running around? Also a little gross. Would an anime nerd, elbow deep in Cheetos, sit beside me. Very gross. As you can see, going to this film was quite a risky move for me, but I survived The Raid, so I thought I would be fine. It turned out that the film was subtitled (yay! ), and the audience consisted of respectable anime fans, as the Studio Ghibli logo received a round of applause. Film festival crowds make me want to cry tears of joy. There is quite a bit going on behind the scenes of a film like this. The director, Goro Miyazaki, is the son of anime legend, Hayao Miyazaki, known for such classics as Lupin the Third: Castle of Cagliostro, Princess Mononoke, Spirited Away and My Neighbor Totoro, all under the renowned Studio Ghibli. This is Goro’s second film, his first being Tales of Earthsea, which possessed many of the individual elements of a great Ghibli film, but it failed to come together as a whole. I’m happy to report that his second effort is a success. 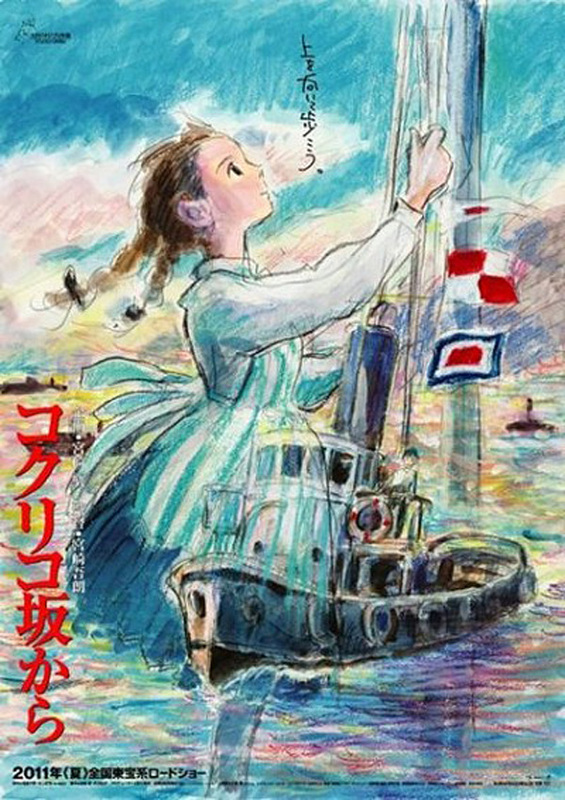 From up on Poppy Hill is a touching emotional story about the pains and joys of growing up, and importance of fighting for what you believe in. The film is set during the 1960’s in a small town outside of Tokyo. The Olympics are coming to Tokyo and in order to prepare, many buildings are being built, while old ones are being torn down. One of the buildings set to be demolished is the clubhouse of the students at the local school. Upon hearing the news regarding the demolition of their clubhouse, the students band together in an attempt to save it. Caught in the middle of the action are two students, Umi and Shu, who harbour feelings for each other, but an emotionally devastating series of events may prevent them from ever being together. The beginning of Poppy Hill starts off quite slowly, and for a time I was worried that Miyazaki may have missed the high benchmark of most Ghibli films, but I was quickly relieved after viewing a wonderful scene in which the students place banners on the clubhouse to protest the demolition, and the reckless Shu jumps off the roof of the clubhouse into a pool of water to express his disdain. Viewers will not find the usual Ghibli staples of the fantastic, supernatural or magical, but Miyazaki more than makes up for it, with charming characters and heart felt moments. The characters are interesting and distinct, which makes them seem more like real people rather than animated characters. The animation style and music remind me of older Ghibli films, rather than more recent epics like Princess Mononoke and Spirited Away, but they suit the story’s setting and subject matter very well. In the end, From up on Poppy Hill is a fine film and a worthy addition to the Studio Ghibli Filmography. There are plenty of smiles, laughs and touching moments to be experienced. I think that this is a great choice for a date night or a family movie, although it may be too mature, although not inappropriate, of a film for children.